There are a wide range of activities and experiences available to cadets at all age levels. All Squadrons deliver a formal training programme which is specified by HQ Air Cadets so that cadets across the organisation have a similar training experience. World-class opportunities to both young people and volunteers. Real value to individuals, cadets and staff, personally, socially, academically, and professionally. A progressive programme which is enjoyable, exciting, challenging, stimulating, and achievable. Opportunities to gain recognized qualifications. 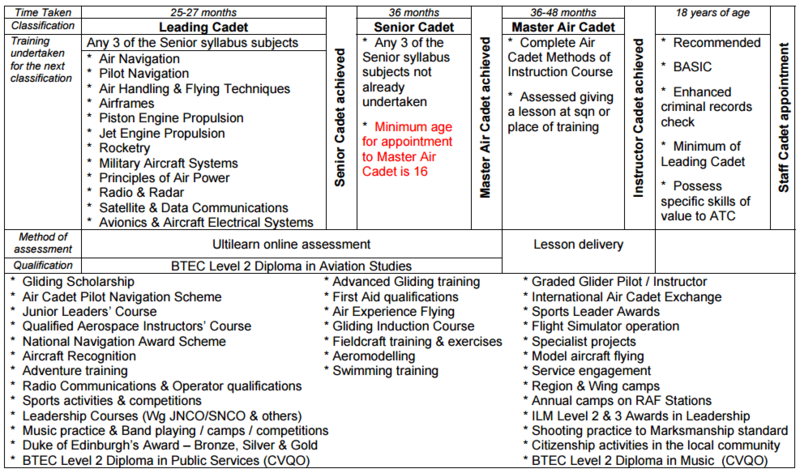 The matrix below gives an overview of the complete syllabus from First Class level up to Master Air Cadet in the chronological order it should occur as a cadet develops. 470 runs a very active DofE programme where all cadets are registered at Bronze Level when they start with us. We have a great deal of success with the award scheme and it is one of the most popular aspects of our training programme. The Air Training Corps offers many avenues for young people to develop and leadership is an important part of what we do. From simple team building activities to formal training courses and the grueling Junior Leaders course there are lots of opportunities to develop. If you make a positive contribution at your Squadron you may even be selected for promotion to a cadet noncommissioned officer. BTEC’s (Business and Technology Council) Awards are a very popular and widely recognised qualification across the UK. 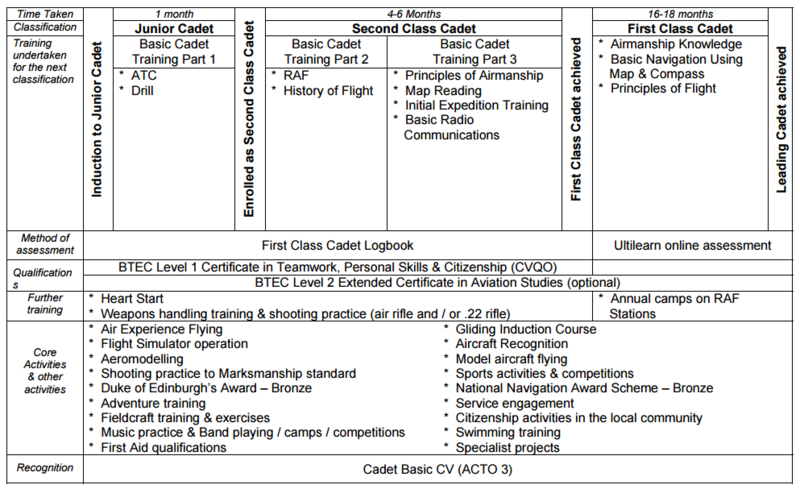 The Air Training Corps training syllabus allows cadets to be rewarded with diplomas in related subjects just for participating and completing our programmes. There are many other qualifications that can be earned during your time in the ATC, both as an Air Cadet or a Civilian member of staff. It is now compulsory for all cadets and staff to have an entry level first aid qualification. There has been a number of instances where our members have used their new skills to save a life so this is an extremely important programme. Vocational qualifications are also available and we offer our volunteer staff the opportunity to develop and seek qualifications which help them professionally and as instructors.